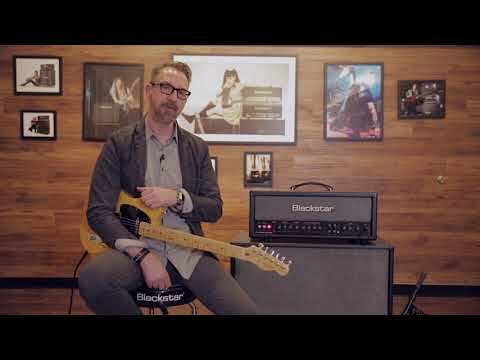 The Blackstar HT Club 50 MK II Guitar Amplifier Head offers the same irresistible versatility and power of the HT Club 40 Combo in an easily transportable amp head. Whether you're taking to the studio, hitting a club, or taking to the stadium stage, this is the perfect amp for the gigging guitarist. Following the success of the original HT Venue Series, the team at Blackstar responded to feedback from musicians, and spent 3 years testing and improving upon their already exceptional design. The results are upgrades across the board featuring improved tones, greater tone sculpting capabilities, improved connectivity, professional level recording options, and a lighter design that is easier to transport. The Blackstar HT Club 50 MK II boasts a pair of ECC83s and a pair of EL34s, which come together to deliver a wondrous output that is full of crunch and warmth. The amp is equipped with two channels - Clean and Overdrive -, which each have two voicing options. Channel- and voice-hopping can be done with a footswitch, making each performance as dynamic as you could want it to be. The Clean channel voices are based on a classic high gain American circuit, and a fatter and thicker British circuit. You can shape the EQ of each one using independent Bass and Treble controls too. The Overdrive channel voices are modelled on the award-winning HT Venue Series, offering high gain outputs that are infused with a natural sounding response. As with the clean channel, the voices are footswitchable, and controllable using the Bass and Treble controls. Live performances can be as dynamic as you wish thanks to the easy to use switching setup. The HT Club 50 MKII is equipped with Blackstar's patented ISF tone-shaping control, which offers a US-type amp response at one end, and a UK-type amp response at the other - with an infinite number of possibilities between the two! The result is an easier and more efficient way of finding that elusive tone that you've been seeking. The HT Club 50 MK II has a redesigned digital reverb circuit, which features switchable Dark/Light settings. The Dark setting is based on a room reverb, whilst the Light setting is based on a plate reverb. Whether you're playing in a small venue and want to create a larger impression, or want to dial it back and keep your tone tight, the reverb effect gives you the ability to inject depth into your tone. The addition of an Effects Loop means that you can input outboard effects via send and return connections to expand your tone shaping options. The Blackstar HT-Club 50 MK II is equipped with a range of connectivity options to meet your demands. When laying down tracks in the studio or on the fly, the professional USB audio connection allows you to output up to four channels of the guitar signal, dry, preamp out, and stereo emulated out into your DAW of choice. There are additional outputs that includes a pair of speaker emulated outputs (XLR and stereo jack) with 1x12 and 4x12 options. Whether you're hitting the stage or taking to the studio, Blackstar have thought of everything with the HT Club 50 MK II.